Now, does this look like a cat who would pounce on the bed at 3:00 in the morning, pound on closed doors or bat at the blinds to wake you up? No, she just looks like a sweet, sleepy kitty without a mean-spirited bone in her body. Well, thanks to some drastic measures and a little patience, she's not quite that bad anymore. Just a couple of weeks ago she had me on my knees in prayer, sobbing, because I was so tired and so frustrated. 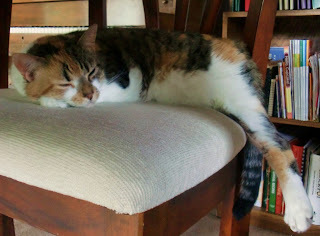 Cayenne is a typical cat, nocturnal and very pushy. She is very vocal with her demands and will sit in bed each morning with her nose against mine until I wake up and take care of her. The noises she makes otherwise - pounding on doors and strumming blinds like a harp - are just as nerve-wracking when you're trying to get your beauty rest. So I did some research, got some ideas about correcting kitty behavior, and started some serious trial and error. I never realized how labor-intensive cats could be (she's my first, and I'm a dog person by nature) so these steps have taken some real effort. The first thing we did was start moving her feeding time closer and closer to our bedtime. She'll still start talking to me at about 4:00 in the afternoon, but we've discovered that ignoring her does wonders. Every day her feeding time has gotten a half hour later, making sure that she's super-sleepy and fully-fed when we're ready to crash. This makes it a little later in the morning when she's ready to get moving. We've learned that Cayenne is really just waiting for any acknowledgment, which encourages her to continue what she's doing. So no matter how much she meows, rubs or head-butts me, we've set her feeding schedule and we're sticking with it. The same goes with the other noises. We tried squirting her with water or an air canister to stop her behavior, but she learned to listen for the sound of movement and then she'd run. Two seconds later she'd be back for another go-around. Ignoring her and allowing her to tire herself out for a minute or two is absolutely the best bet for this issue. We also put a folding chair on its side in front of the one door in the entire house that is closed - the hall closet. Apparently she is easily offended by closed doors and this is her retaliation. Leaving the chair there keeps her from being noisy in the morning, and hopefully will keep her away in the long run. We'll see. There are always solutions to the little annoyances if you're willing to look for them. Remember that this is still your house, even if the four-legged ones out number you.